School representatives from around the nation observing the students at work. If you are a student with a mind that is looking to fill its hunger for knowledge and learning, or if you don’t know what career you want to pursue in, then look no further than room 514’s newly created STEM Lab. The STEM Lab showcases elements such as science, technology, engineering, and math to young minds, which is very crucial in a world that is technologically advancing. Students work in modules, with each module focused on a certain topic, and rotate from one to the other, which gives them the chance to see what interests them and helps in deciding a possible a career in that field. From gene splicing to using 3-D printers, the possibilities are endless for any student looking to discover more about themselves. Of course, none of this would’ve been made possible without the contributions of Mrs. Springer, who works in the mathematics department on campus. Room 514 was passed on to be used for various classes before eventually being abandoned all together. For years it went unused, until it caught the eye of Mrs. Springer, who sought out different ways the empty room could be used for. She came to the idea of turning the room into a STEM Lab with the goal to broaden the engineering department. She didn’t exclude the class to just one specific grade level, instead making it so that all grade levels who were interested were allowed to participate in enrolling in the class. The students who enroll in the classroom are expected to learn from scratch by themselves, so that they can get a sense of independence, which will ready them for the real world. Each module has the students working on different topics but at the same format. They watch videos, then answer questions, until finally doing experiments. While this may seem repetitive to some, this style of learning displays structure and order, which the students can learn from as well. I got to experience the new STEM Lab first hand on Tuesday, November 6, when the journalism class photographer, Justin Rilveria, and I visited room 514 to see what all the excitement was all about. 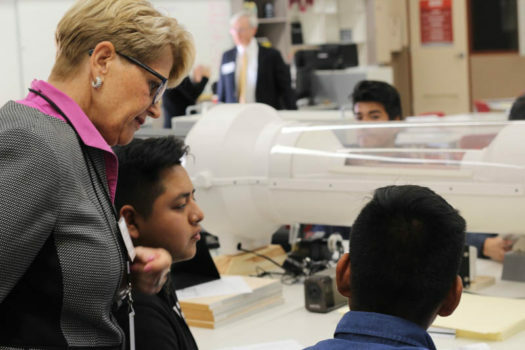 On the day we visited, representatives from other schools across California were also there to observe the students at work. While in there we learned that each representative was a part of the California Department of Education. They provided the STEM Lab with the money to help its development in promoting engineering skills for the students, which can lead them to scholarships and high paying jobs in their futures. The STEM Lab uses equipment of the highest degree that was once used by industry leaders. It was explained to me by Mrs. Springer that the rotational learning modules were there to promote collaboration an exploration among students. Room 514’s new STEM Lab is an opportunity that I believe more students should take advantage of. Its not a traditional type of classroom and you’re not always doing the same thing. Each student is given the privilege to work with tons of space and equipment and will be introduced from up to 12 different modules and careers. The students will be exposed to so many different jobs that by the end of the school year, they’ll know what subject interests them and what to achieve to get to that point. Even if your a student who has no clue what career you want to pursue in, I guarantee that the STEM Lab will help you find out what catches your interest. Its a definite possibility that you’ll become interested in something that you never thought would interest you. So long as you’re serious about what you want to accomplish in the world of science and math, the STEM Lab is the place for you.